Mexican gray wolf F986, Toluca, was born at Zoo New England in Stoneham, Massachusetts, in 2005. Her home was the Utica Zoo in Utica, New York, until she was sent to the Wolf Conservation Center in South Salem, New York, in 2013, and later paired with M804, Sabio. She and Sabio moved to Southwest Wildlife together in December of 2015. Sabio has since passed away. Toluca is now living with one of our favorite male wolves, M958, Gray. We hope that she and Gray will hit it off and enjoy living together. 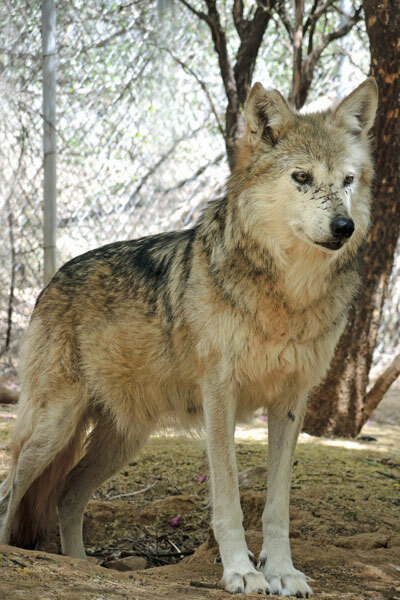 She is a gorgeous, alert wolf who is interested in everything that happens near her area of the sanctuary.